Project Summary: The rancher-led partnership is protecting privately-owned land and working landscapes through easements, grass-banking and habitat restoration. A U.S. Forest Service Hot Shot lights the Maverick Burn in the Peloncillo Mountains, in Cottonwood Basin. The Malpai Group was organized and led by area ranchers who saw that the land—and their way of life—were threatened by deteriorating rangeland and by the spread of development and subdivisions from nearby towns. 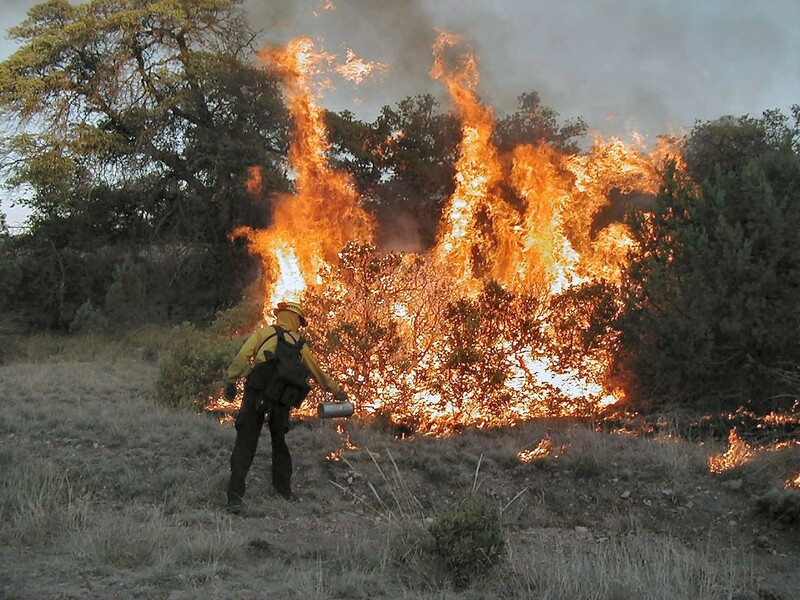 Also, the lack of natural wildfires to rejuvenate the landscape and the hit-or-miss rainfall so typical of Southwestern grazing lands contributed to the land’s deteriorating condition. The group originated as a series of informal discussions among ranching neighbors and was formally organized as a non-profit organization in 1994. Since then, the group has pursued activities to protect and restore the ecological diversity and productivity of the land, including rangeland restoration, reintroduction of fire, wildlife conservation, and endangered species recovery. Arizona and New Mexico Ranchers, USDA Forest Service, USDA Natural Resources Conservation Service, Hidalgo & Whitewater Draw Natural Resource Conservation Districts, USDI Bureau of Land Management, USDI Fish and Wildlife Service, Arizona State Land Department; Universities in New Mexico and Arizona, Arizona & New Mexico Game and Fish Departments, the Animas Foundation, The Nature Conservancy. Protected 77,000 acres of private land through conservation easements, preventing subdivision and development and ensuring that these lands will remain natural wildlife habitat and productive ranch land. Pioneered the GrassBank, which allows ranchers to rest their grasslands while sustaining their livestock. Grass on one ranch is made available to another rancher’s cattle in return for conveying land-use easements prohibiting subdivision. The Malpai Borderlands Group holds the easements. Reintroduced fire to more than 75,000 acres. Monitoring indicates that ecological conditions on Malpai ranches have improved. Hosted several meetings every year, sharing new scientific and land management information with neighbors and cooperators. "There’s nothing better, nothing more a man can do than to leave something that’s going to continue on. And I hope someday, somewhere down the years that’s coming along, that somebody will say–that’s a great move they made." The group invented grassbanking, allowing ranchers to rest their land by temporarily moving herds to “greener pastures” in exchange for conservation easements.